Oral submucosal fibrosis (OSMF) is chronic disease occurring due to a subtle change in fibroelasticity of oral mucosa and oropharynx and is characterized by blanching and burning sensation in the oral cavity and stiffening of oral mucosa leading to trismus and inability to open the mouth mostly in people with habitual betel quid chewers., The symptoms and signs depend on the progression of the lesions and number of affected sites. OSMF is a debilitating but preventable oral disease., It is found among people who chew betel nut (Areca catechu) with or without tobacco and other ingredients. Other than that, immunological diseases, the prolonged deficiency of iron and vitamins in the diet, genetic factors, and autoimmunity are also important factors in the development of OSMF. Gutka is the predominant form of areca nut consumption in most parts of India. The disease usually begins in the oral cavity with vesicles formation and juxta epithelial inflammatory reaction followed by fibroelastic changes in lamina propria with epithelial atrophy leading to stiffness of oral mucosa causing trismus and difficulty in mouth opening. It spreads gradually and may involve the oropharynx. The oral mucosa loses its resiliency and becomes blanched and stiff in its advanced stage. Other features of the disease include pigmentation and recurrent ulceration of oral mucosa, restricted movement of the soft palate, dryness of the mouth, burning sensation, decreased mouth opening, and tongue protrusion. Apart from the avoidance of irritants, the management of OSMF is mainly followed by two major strategies—medical and surgical; however, the question of improving the elasticity of oral mucosa and thus increasing the mouth opening is prevailing. Considering the above facts, apart from medical and surgical management, physiotherapy is offering the third dimension to the management of OSMF. Basic physiotherapy techniques, viz., active jaw movements and stretching have been tried postsurgically as a supportive therapy. Apart from this, ultrasound (US) is conventionally being used for fibrous and scar tissues, however, it has not been extensively used for oral mucosa. Hence, the present study was undertaken to find the additional effect of US application in patients with OSMF by identifying the changes in mouth opening. The approval was obtained from the “Human Research Ethical Committee” of the institute before initiating the study. The study was carried out at KM Patel Institute of Physiotherapy, HM Patel Centre for Medical Care and Education, Shree Krishna Hospital, Karamsad, Gujarat, India. All the patients referred for physiotherapy treatment were randomized into two groups: experimental (US and jaw opening exercises) and control (jaw opening exercises) group based on inclusion and exclusion criteria. The randomization was done using shuffling cards and sequentially numbered, sealed, opaque envelopes were used as a method of concealment and the outcome assessor was blinded. Patients with confirmed diagnosis of OSMF referred for physiotherapy. Patients participating in any other ongoing research project. Written informed consent was obtained from all the patients before enrolling them in the study. Total of 26 patients, diagnosed with OSMF, referred for physiotherapy treatment were enrolled and randomized into two groups, that is, experimental (n = 13) and control group (n = 10). 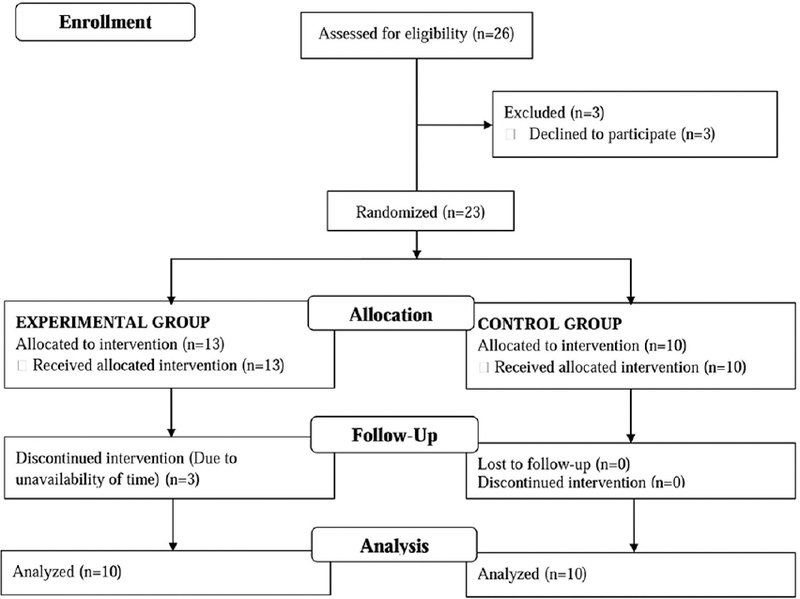 Of those, three patients in the experimental group discontinued the treatment in-between and so 10 in each group were analyzed for maximal mouth opening before and after the intervention [Figure 1]. The patients in experimental group were given US (Tapsi Electro Medical System and Services, Cyclops 1 and 3 MHz) with 0.7 W/cm2 of intensity for 7 min with 3 MHz of transducer head  and jaw opening exercises (wide mouth opening and maintaining it for 5 s, side to side lateral deviation and protrusion of mandible—10 repetitions of each exercise). The patients in control group were given only jaw opening exercises. Both the groups were treated for 1 week and maximal mouth opening was measured using vernier caliper before and after the intervention. The maximum interincisal distance was taken as the maximal mouth opening (MMO) of an individual. Measurement of MMO was recorded by asking the patients to open their mouth as wide as possible, whereas the examiner measured the maximum distance from the incisal edge of the maxillary central incisors to the incisal edge of the mandibular central incisors at the midline. Data analysis was carried out using t-test with a level of significance α = 0.05 and 95% confidence level. The mean age of patients in the experimental group was 33.25 years and in control group was 35 years. The average duration of tobacco consumption in the experimental group was 23.56 years and in control group was 22.78 years. The results showed that both the groups had statistically and clinically significant improvement in mouth opening before and after the intervention. The patients in experimental group had improvement of about 0.47 ± 0.09 cm (P = 0.002)* and in control group had improvement of 0.25 ± 0.05 cm (P = 0.003)* in maximal mouth opening [Table 1]. However, when both the groups were compared for improvement in mouth opening, the patients in the experimental group had more improvement of 0.22 cm (P = 0.006)* in mouth opening compare to control group [Table 2] (*P < 0.05). The aim of the study was to find the effectiveness of therapeutic US in addition to exercises in patients with OSMF. The results of present study show that the patients, when given US in addition to exercises, had more improvement in mouth opening compared to the patients given only exercises. This additional improvement by US application can be explained on the basis of its mechanical properties (absorption, cavitations, acoustical streaming), which interact with the cellular and molecular complexes within cells, alters cellular membrane properties (cellular adhesion, membrane permeability, calcium flux, and proliferation) leading to modulation of signal-transduction pathways and gene products associated with inflammatory response and cells, which are directly involved in healing response. US decreases inflammation, increases vasodilatation and waste removal, accelerates lymph flow, and stimulates metabolism thus accelerates healing, increases the extensibility of collagen fibers and provides pain relief. US proves to be an efficient deep heating modality. It increases the temperature of buccal mucosa due to its absorption by the tissue proteins that converts the ultrasonic waves into heat. It has been found that heating the tendon in combination with low load, prolonged stretch (active or passive) produce the greatest elongation with least damage to the tissue. Thus, if US is applied at a higher intensity for a longer duration, a higher tissue temperature is attained. Heating the tissues in combination with exercises causes loosening and softening of adherent fibrous tissues by separation of collagen fibers and thus leads to the increased pliability of oral mucosa and improves mouth opening. There was significant improvement in mouth opening in both the groups, that is, exercises alone and the US along with exercises in patients with OSMF. However, US in combination with exercises gives more improvement in mouth opening compared to exercises alone. We acknowledge Dr. R. Harihara Prakash (PT), Prof and Head, KM Patel Institute of Physiotherapy for permitting us to carry out this research work. We would like to thank all the participants of the study for their cooperation. We thank the consultants of ENT and Dentistry Departments of Shree Krishna Hospital, Karamsad for referring the patients of OSMF for Physiotherapy. We thank Dr. Trupti Parikh (PT) for helping us in statistical analysis. Canniff JP, Harvey W, Harris M. Oral submucous fibrosis: Its pathogenesis and management. Br Dent J 1986;160:429. Cox SC, Walker DM. Oral submucous fibrosis. A review. Aust Dent J 1996;41:294-9. Lambade P, Dolas RS, Dawane P, Rai B, Meshram V. “Oral Submucous Fibrosis Scoring Index” to Predict the Treatment Algorithm in Oral Submucous Fibrosis. J Maxillofac Oral Surg 2016;15:18-24. Gupta VK, Malhotra S, Patil R, Tripathi A. Oral submucous fibrosis at pediatric age, now time to think: Series of two cases. Indian J Med Paediatr Oncol 2013;34:107. Rajendran R. Oral submucous fibrosis: Etiology, pathogenesis, and future research. Bull World Health Organ 1994;72:985. More CB, Ansari M, Patel H, Adalja C. Oral submucous fibrosis-a hospital based Retrospective study. Journal of Pearldent. 2010;1:25-31. Pindborg JJ, Mehta FS, Gupta PC, Daftary DK. Prevalence of oral submucous fibrosis among 50,915 Indian villagers. Br JCancer 1968;22:646. Ali FM, Patil A, Patil K, Prasant MC. Oral submucous fibrosis and its dermatological relation. Indian Dermatol Online J 2014;5:260. Watson T, Yong S. Therapeutic Ultrasound. In: Watson T, editor. Electrotherapy-Evidence based practice. 12th ed. PA, USA: Elsevier Ltd., 2008. p.179-200. Johns LD. Nonthermal effects of therapeutic ultrasound: The frequency resonance hypothesis. J Athl Train 2002;37:293. Rimington SJ, Draper DO, Durrant E, Fellingham G. Temperature changes during therapeutic ultrasound in the precooled human gastrocnemius muscle. J Athl Train 1994;29:325. Warren CG. Elongation of rat tail tendon: Effects of load and temperature. Arch Phys Med Rehabil 1971;52:465-84.